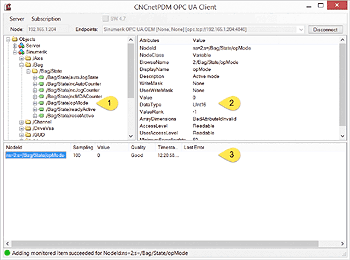 CNCnetPDM OPC UA for Siemens Sinumerik Operate version 4.5 enables you to monitor machine-, process- and quality-data from Sinumerik 840D SL & 828D controllers from a remote PC. It also allows to write and change a wide range of parameters on these devices. 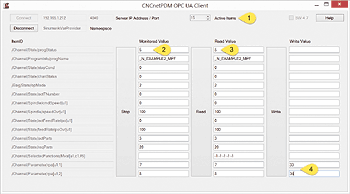 This document describes setup and configuration of OPC UA components on controllers with software Operate 4.5 SP3 and communication with a remote PC. Instructions on OPC UA setup and test with free SINUTRAIN versions are also included. 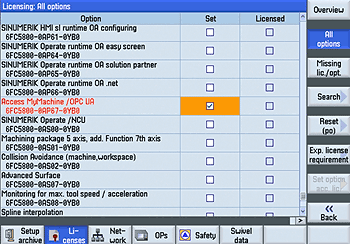 Note: For software Operate version 4.7 see Sinumerik 840D 828D OPC UA (SW 4.7). 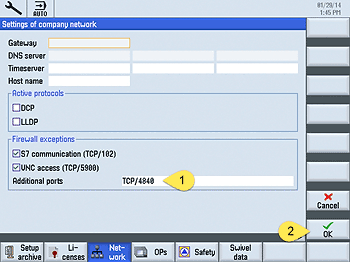 Enable the OPC UA communication port (TCP port 4840) by clicking button [change] in area "Startup -> Network ->Company network". Add TCP port 4840 (1) and click [OK] (2). Next startup the controller in service mode without HMI: When the SINUMERIK screen is displayed during startup and the PCU base version at the bottom right, press key '3' and log in as user auduser. If the target folder does NOT contain a file named systemconfiguration.ini you can simply rename MiniWeb_linemb_systemconfiguration.ini to systemconfiguration.ini. If this file already exists you have to add the content of MiniWeb_linemb_systemconfiguration.ini to this file. Open systemconfig.ini with a text editor and look for section [processes]. If it doesn’t exist you can copy the whole content of MiniWeb_linemb_systemconfiguration.ini, add it to the end of systemconfiguration.ini and save the file. PROC100= image:="/siemens/sinumerik/hmi/miniweb/release/miniweb.exe", process:=MiniWebServer, cmdline:="../System ../WWWRoot", startupTime:=afterServices, workingdir:="/siemens/sinumerik/hmi/miniweb/release"
For NCU and PPU use the IP Address of -X130, for PCU 50 the address of ‘Local Area Connection 2’. OPC UA setup on the free version of SinuTrain for SINUMERIK Operate V4.5 Ed.3 differs a bit from the procedure on a real controller but exactly works in the same way. You have to register a free account to be able to download the program. Download and install SinuTrain for SINUMERIK Operate V4.5 Ed.3 - Basic. If you accept all default settings you are able to use the paths mentioned below. Start SinuTrain and create one new machine f.i. ‘Lathe with driven tool’, it is recommended NOT to use the ‘DEMO-Lathe’ device. Replace all ‘localhost’ entries in this file with the IPv4 address of your PC. PROC100= image:="C:\Siemens\SinuTrain\SINUMERIK CNC-SW 840D sl 4.5 SP6 HF3\hmi\siemens\sinumerik\hmi\miniweb\release\miniweb.exe", process:=MiniWebServer, cmdline:="..\System ..\WWWRoot", startupTime:=afterServices, workingdir:="C:\Siemens\SinuTrain\SINUMERIK CNC-SW 840D sl 4.5 SP6 HF3\hmi\siemens\sinumerik\hmi\miniweb\release"
Restart the machine from the SinuTrain Workbench and make sure that systemconfiguration.ini contains the additional process. For OPC UA it is required that your PC trusts the Siemens certificate issued by your controller. Therefore it is necessary that it is installed in the certificate store of your PC. As this is a self-signed certificate it is NOT automatically installed. To install the certificate right click CNCnetPDM.OpcUA.Client.exe or CNCnetPDM.OpcUA.SimpleClient.exe, select ‘Run as Administrator’ and connect to your controller. This only has to be done once. Start CNCnetPDM.OpcUA.SimpleClient.exe, enter the IP Address of your controller into the textbox right to [Connect] e.g. : 192.165.1.212 (1) change port (2) only if you use a port different from 4840. Initially one item is queried, by changing ‘Active Items’ to a different value you can activate up to 15 items. The 15 predefined values under ‘ItemID’ are known to work well on most controllers. Of course you can change them according to your requirements. The last two items are 2 writable R Parameters (user variables) that are visible at the controller: [MENU SELECT] - [Parameter] - [User Variable]. Verify that process miniweb.exe is started at the controller. On a SinuTrain setup check that an additional command line window exists and one of the last lines contains ‘OPC UA Server started successfully on Port 4840’. If the window is opened but there’s no line with ‘OPC UA Server started successfully on Port 4840’ check file OPC_UAApplication.xml. If you see error ‘Connect failed BadIdentityTokenRejected’ on SW 4.5 make sure that you didn’t check SW 4.7 in the dialog.